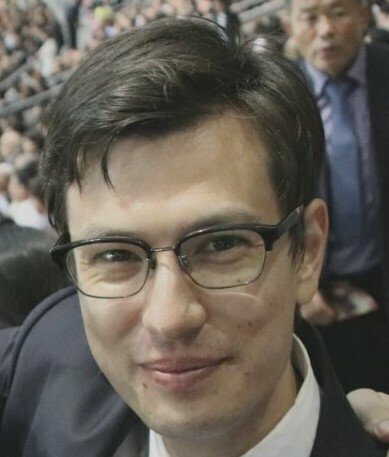 Alek Sigley is a graduate student at Pyongyang’s Kim Il Sung University and runs the North Korea tour company Tongil Tours. You can read his first column for NK News here. Last week I examined a North Korean women’s fashion magazine. This week I want to introduce NK News readers to a men’s fashion magazine which I recently obtained. 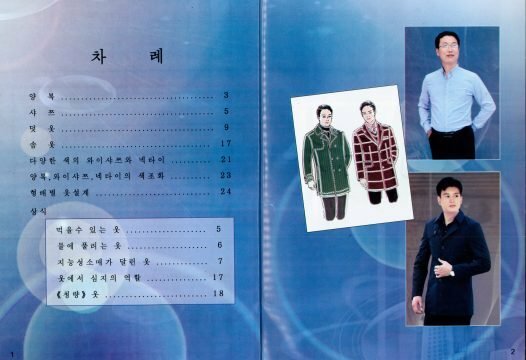 The magazine is produced by the same “Clothing Research Center” (피복연구소) as the women’s fashion magazine from last week, and found for sale in the same generally “locals only” roadside book stalls. 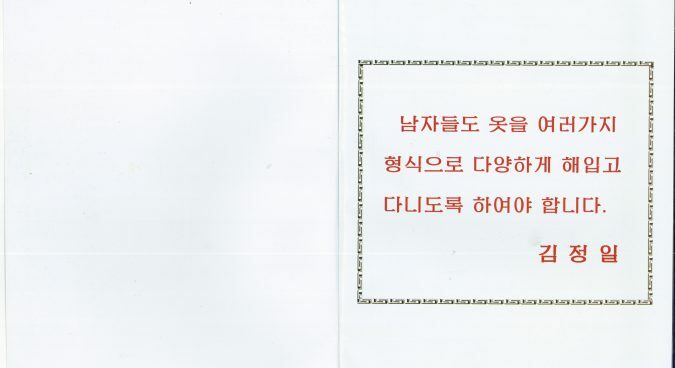 The women’s fashion magazine, which was printed in 2017, indicated that the “Clothing Research Center” was under the auspices of the “Ministry of Foodstuffs and Daily Necessities Manufacture” (식료일용공업성). But this men’s magazine, and a second women’s fashion magazine in my possession (the newest edition of the one in the last post), were both printed in 2018, and mark the “Clothing Research Center” as part of the “Foodstuffs and Daily Necessities Research Institute” (식료일용연구원) under the “Ministry of Provincial Industry” (지방공업성). 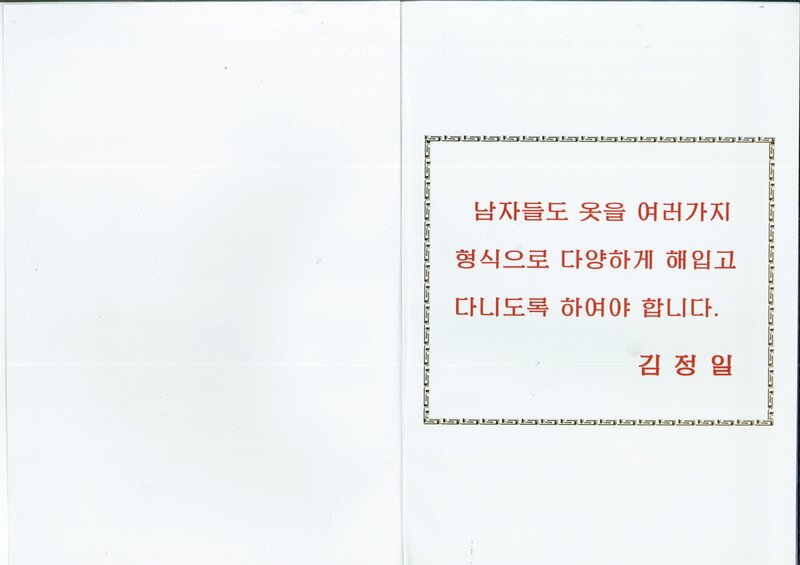 This reflects a change in name of the “Ministry of Foodstuffs and Daily Necessities Manufacture” which occurred in early 2018, and some institutional reshuffling within the ministry, which are in turn part of a broader effort on the part of the DPRK government to revitalize light industry and the provincial economies. Despite the changes in ministerial nomenclature, both 2018 magazines continue as part of the same series as their predecessors, the men’s magazine being titled “Men’s Clothing: Shape and Design Materials (9)” (the women’s magazines have the exact same title but with “men” swapped for “women”). The men’s magazine carries out the same function as the women’s: to provide an inventory of state-sanctioned styles, and is also structured in a similar manner, with color photos of models in the front and designs in the back, and the occasional block of text offering fashion advice (although the men’s magazine doesn’t have clothing for each of the four seasons as the women’s does). 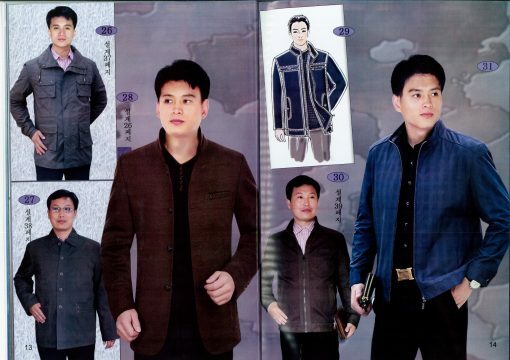 Like last week’s women’s fashion magazine, this men’s fashion magazine also begins with a quote from Kim Jong Il. This magazine is about half the thickness of the two women’s fashion magazines. It is a mere 47 pages, in comparison to the one hundred and three page length of the women’s magazines. 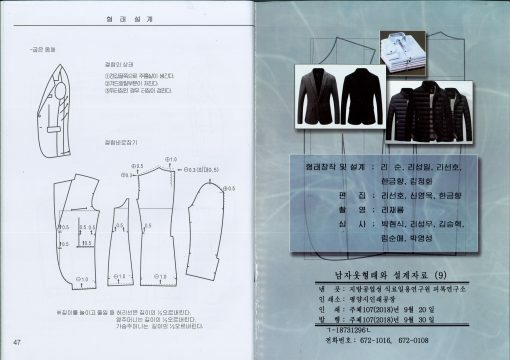 This, plus the particular emphasis the “Clothing Research Centre” places on women (it has stated its mission as to “make Korean women more beautiful”), and the above quote do together work to provide the impression that dressing nicely is the primary obligation of women, and more secondary a task when it comes to men. Indeed, when women are represented in state-sanctioned popular culture as “flowers”, it’s not surprising that there would be extraordinary social pressure on them to dress accordingly. It also struck my attention that the quote beginning the women’s magazine presented clothing as needing to “embody the innate characteristics of our (Korean) people”. The men’s magazine quote however, drops this reference to tradition. It is a much discussed topic in the social sciences that postcolonial nationalist ideology tends to portray women as the bearers of tradition. This manifests on the body, where women, much more so than men, are expected to wear traditional clothing. Men, by contrast, don Western business suits, a symbol of modernity. Table of contents, some nice color sketches and an introduction to the two main models featured in this magazine. Like in the women’s fashion magazine we looked at last week, outfits are numbered, and a portion contain notes pointing to designs at the back of the book. The suits here are contemporary in design. They feature thinner lapels and a high gorge (the meeting point of the collar and the lapel), which are currently the international mainstream. Like the British suit, they are structured in fit with large, wide shoulders and a little bit of bagginess as opposed to the more form fitting Italian suit. Ties are also on the wider side, a contrast to the thinner neckties that are currently trendy. The trousers cannot be fully seen here, but I am reminded of the time I went with a friend (one of the other Kim Il Sung University foreign students) in Pyongyang to the tailor to help him get an outfit tailored. When they asked how he’d like the trousers, they gave him the choice of a straight leg or a bell-bottom (literally “trumpet” legs in Korean). When I recounted to this some of my older friends they laughed and quipped that such a trend was indeed of another decade. It also reminds me of the time where at my wedding, which we held in Pyongyang, I was wearing a more fitted suit, and one of the Korean guests offered his opinion that I looked handsome indeed, but that my suit was “too small”. Both anecdotes offer interesting insights into the fashion preferences of North Korean men. 1. It’s nice that under socialism, people who are, for want of a better phrase, endowed with differential levels of good looks, are offered the opportunity to pursue careers in modeling. Marx did say “from each according to his ability” though, and modeling is about more than just posing, is it not? 2. It’s evidently not as important for male models to be attractive as it is for female ones. I think most would agree that the models in the female fashion magazine from last time had nice faces at least. The younger one on the right however, I could imagine being a member of some sort of boy band. Perhaps the other one was chosen to make him look more handsome by comparison? Regardless, I think most would agree that he’s much more of a natural, I mean, look at that wistful downward gaze in no. 2. As mentioned previously, the general level of fashion on the street tends toward the more formal. I rarely see men wearing t-shirts even in summer, except perhaps when engaging in physical labour or sports. The button-up shirt, whether long or short-sleeved, is the go-to item. And on the right, a snippet introducing “Clothing that Dissolves in Water”. The model in No. 7 holds a DSLR. As North Korea’s middle class grows, DSLRs are becoming within the means of more and more families. In no. 10 the model poses with a smartphone. I’ve also noticed that smartphones are being commonly used by ordinary folk in Pyongyang, from taxi drivers to restaurant waitresses. In fact, when I think of it the only person I can recall who doesn’t use one is my seventy-three year old Literary Theory teacher at Kim Il Sung University, who still uses a bulkier Nokia-style device. That man bag in no. 11 is also trending among men in Pyongyang right now. They really are everywhere. On the left, another, somewhat head-scratching “general knowledge” section on “Clothing with Intelligent Sleeves”, that can through the use of special fabric apparently “monitor or sense” the “health condition of the human body”. Jackets with designs such as the ones in no. 12 and no. 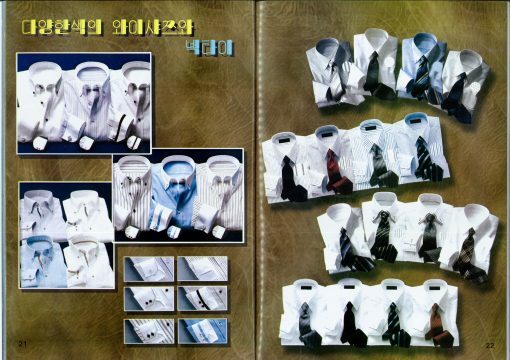 13 can be found off the rack in a lot of the clothing stores we’ve seen in Pyongyang. They’re often imported from China and popular among younger men. It’s interesting to see asymmetrical designs here. I think that’s just starting to become a thing in North Korea. It really does seem that the older man is channeling a more ajŏssi (“uncle”, a term used to describe middle-aged men in general) look while the younger one wears more fashion forward clothing that would only be sported by youths. Those tinted glasses in no. 27 really do epitomize the ajŏssi look to me. The moment I look at them I can already get a sense of a friendly, down-to-earth middle aged man with a heavy tan and a breath smelling of soju and cigarettes. Also, like the women’s magazine from last week, at least some of these faces appear to be Photoshopped on. 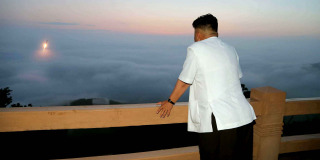 I think this is a sign of North Korea’s receptiveness to some new technologies, which has become especially manifest in recent years. These color sketches are nicely done. 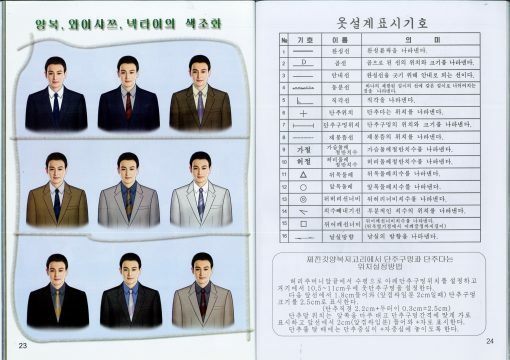 But I wonder whether the pale, somewhat more boyish-looking facial features of these figures hint at new standards of male beauty in North Korea, ones that diverge from the tanned skin and heavier features of the working class heroes who appear in North Korean film towards a more androgynous look you see in the popular culture of other East Asian countries. The beginning of the quilted jackets section. Now appears the hapax legomenon of this magazine– the model in no. 41 makes a single appearance here. The jackets in no. 41 and no. 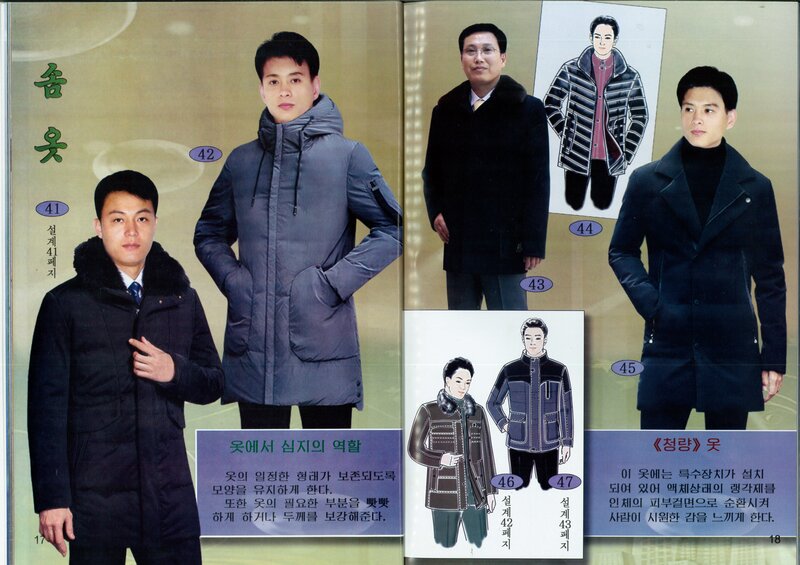 43 are pretty standard looks in the North Korean winter. North Korean men and women both love fur collars, and this is no doubt for good reason as the winters there are cold indeed. The “general knowledge” sections in the bottom give advice on how to help clothing maintain its shape, and description of “cooling” clothing which features inside the garment a device that creates a flow of cooling liquid to keep the skin feeling refreshed. The kind of khaki green jacket in no. 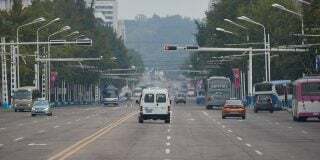 52-54 is also pretty common in the Pyongyang winter. One of us foreign students picked up a cheap one that had a matching pair of padded trousers for cheap at No. 1 Department Store. 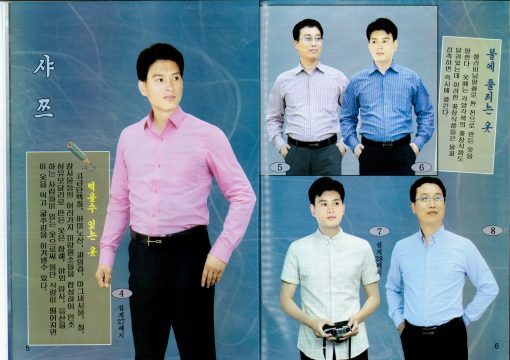 As mentioned just a bit earlier, button-up shirts are a basic item for North Korean men. But I haven’t seen so many wearing the ones with contrast colour collars like in the middle of this section. The pictures on the left are meant as a guide for color coordination between suit, shirt, and tie. On the right the designs section begins with a legend explaining the symbols used in the designs. At the bottom on the right is an explanation, presumably for tailors, of how to arrange button and buttonhole positions on a Western suit (제낀깃양복, “suit with a downturned collar”) jacket. 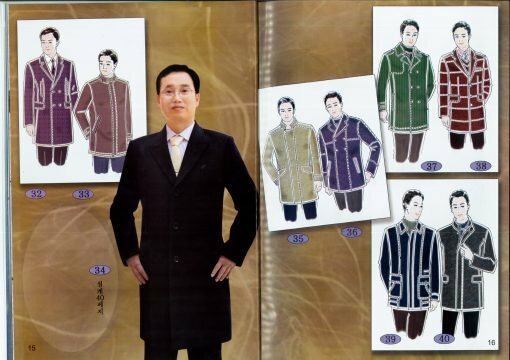 Further into the designs section a similar guide is given on how to arrange buttons on a Mao suit (닫긴깃양복, “suit with a closed collar”). 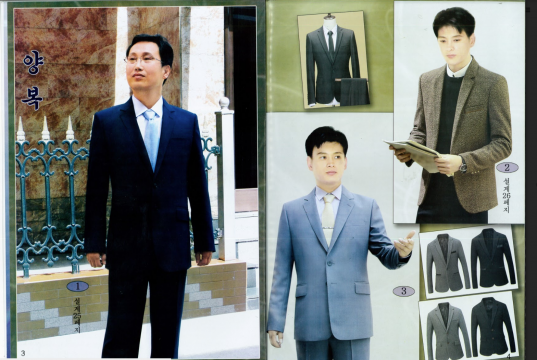 At the end of the designs section is a segment giving advice on how to fix flaws in a suit. Much like the women’s fashion magazine from last time, this magazine features styles that are both quite standard, and others that are more cutting edge and new. 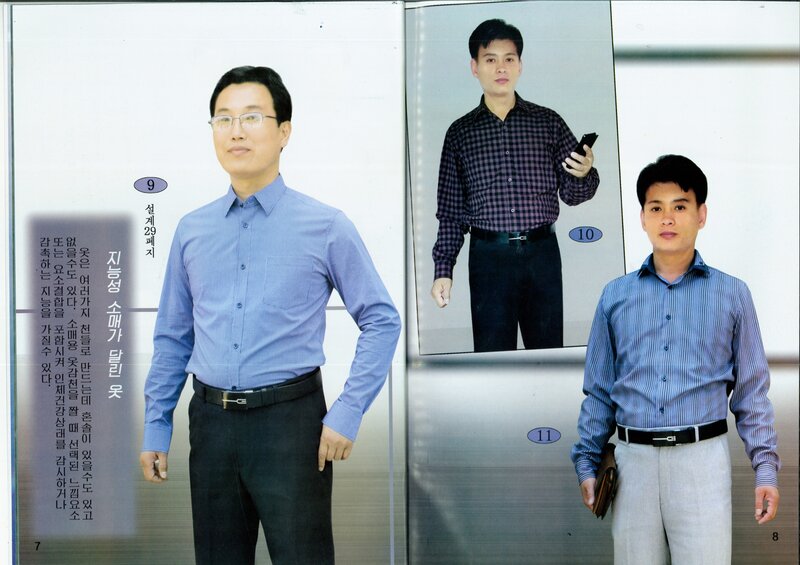 But in comparison with the women’s fashion magazine, and I feel this can be quite safely said about North Korean’s men fashion in general, men’s clothing is a lot less colorful and diverse. It changes a lot slower, and is more conservative. 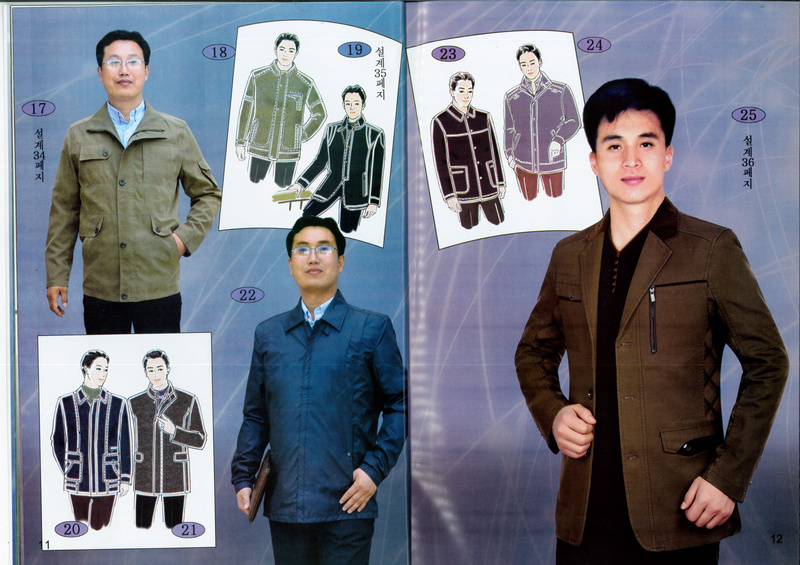 Like the women’s fashion magazine, styles that appear more communist or militaristic, which are still common in North Korea today, especially among men, were conspicuously absent (aside from the section with advice on where to position Mao suit buttons). 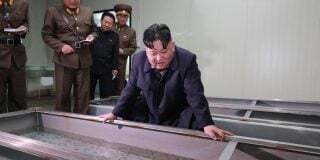 This reminds me of the same time I accompanied one of the other Kim Il Sung University foreign students to the tailor. The shop had a selection of off-the-rack jackets, mostly Chinese imports that resembled some of the more “modern” looking ones featured on the younger model in this magazine. 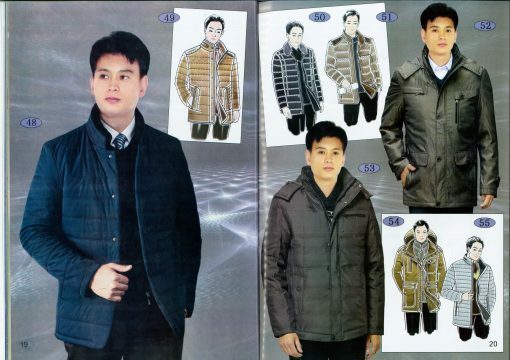 Shop staff were very enthusiastic as my friend tried some of these on and eventually bought one of them, repeatedly saying that the look suited him and that he looked handsome in the jackets. But when he wanted to tailor a more communist-looking khaki green outfit, the same staff member gave him a quizzical look, as if such a style were passé. Despite the emergence of some new fashion trends among younger men, there are still discernable cultural limits to what men can wear. 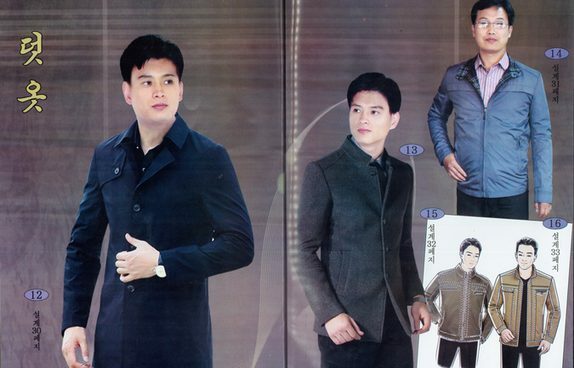 I did once spot inside a shop in Pyongyang a young man dressed in a very “hipster” style. He was wearing a form fitting blazer that was grey, but with blue sleeves, onto which he pinned his portrait badge, and thick, “Buddy Holly” full-framed glasses and hair that was meticulously styled upwards. But this was the one and only time I’d ever seen a man in North Korea dress in such an idiosyncratic style. The other foreign students who were with me and I all reacted with extreme surprise because he seemed so out of place. The look that men adhere to is a more formal one, with button up shirts and jackets with padded shoulders as the basis. 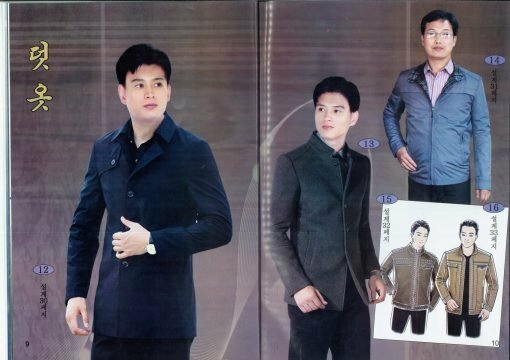 Like women, North Korean men go to great pains to maintain tidy and respectable attire (and while men’s skincare lags behind, that is changing with the recent emergence of locally produced men’s cosmetics). Needless to say, we’re still yet to see anything like street fashion in North Korea, which would presuppose the existence of youth as a category of consumer, and youth subcultures, neither of which have appeared in the development of North Korean capitalism as yet. But who knows what developments we’ll see on the streets of Pyongyang and on the pages of its fashion magazines in a few years’ time? Subscribe to read the remaining 2579 words of this article. Alek Sigley is an Australian currently completing his master's degree in Korean literature at Kim Il Sung University. He is the founder of Tongil Tours, specialists in educational tourism to North Korea. He speaks Mandarin, Korean, and a bit of Japanese. Follow him on Twitter @AlekSigley.